This weekend, the UFC will bring perhaps its most stacked UFC Fight Night card ever to Ledyard, Connecticut for UFC Fight Night 50. Headlining the night will be a rematch between top middleweight contender Gegard Mousasi and submission specialist Ronaldo ‘Jacare’ Souza. The co-main event will feature two heavyweights who couldn’t be more different, yet they find themselves in a similar spot on the roster. Alistair Overeem, a kickboxing phenomenon with devastating power and knockout capabilities takes on a grinder with underrated power and an ability to finish in Ben Rothwell. There are few fighters more enigmatic than Alistair Overeem. Maybe it’s because of his charming good looks or his larger-than-life physique, which ranks amongst the best in the UFC. He’s got muscles on muscles on muscles, and he uses them to punish opponents. His kickboxing pedigree has helped him become one of the most feared strikers in the promotion, and subsequently one of the most exciting fighters in the world. In his promotional debut, he took out former UFC world champion Brock Lesnar in three minutes, ripping Lesnar to the liver and following up with punches to end the fight and his career. Rothwell’s career has been less meteoric in structure, but he has become a staple of the division over the past decade. A veteran who has fought since 2001, Rothwell made his name in the International Fight League during a 13 fight win streak that included wins over Krzystof Soszynski (twice), Roy Nelson and former UFC champion Ricco Rodriguez. If Overeem has the body of a God, Rothwell more closely resembles Homer Simpson. Thankfully for Rothwell, looks can be deceiving. With underrated toughness, Rothwell is the fighter that elite guys try to avoid. He has an ability to stick around long enough to find a way to win. His bout against Brandon Vera in August 2013 saw him lose the first two rounds before bouncing back to finish Vera in the third. The fight itself presents an intriguing style match-up that should lend itself to a compelling bout. 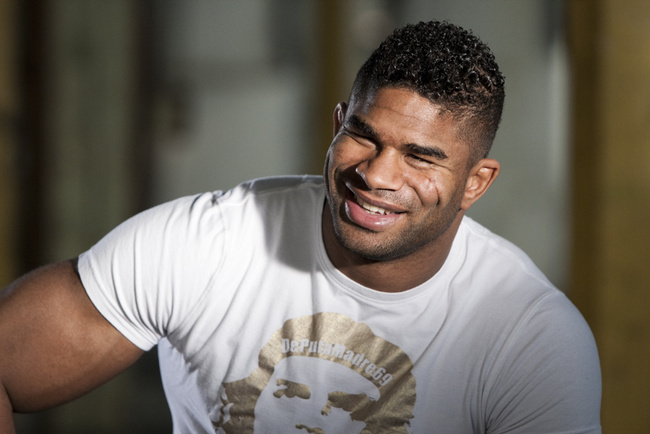 With a win in the K-1 World Grand-Prix, Overeem solidified his reputation as a world-class striker. But what people too often forget is that he`s also quite dangerous on the mat. Early in his career, Overeem was considered one of the most dangerous submission artists in the light-heavyweight division, amassing 19 of his 37 victories by submission (he has 15 KO/TKO victories) including a submission over Vitor Belfort. Rothwell presents such a smothering style; it will be interesting to see what strategy Overeem puts forward. Only three decision victories in his 33 wins, Rothwell will be looking to continue that streak this weekend. Questions have arisen about Overeem’s chin in the last few years, leading many to believe the fighter who looks made of stone could have a glass chin. His back-to-back losses to Antonio Silva and Travis Browne in 2013 have left fans wondering if Overeem is a top-level heavyweight. There’s no denying that both of these fighters need to make their move in the division now. With so few valid contenders, either could be within a few fights of a world title fight. With Rothwell 32 and Overeem 34, this fight is of the upmost important to the longevity of their careers. A win will garner the winner a big money fight, while the loser will be left near the bottom of the pack. It’s now or never for these two heavyweights.